Nashville, TN — Gabe’s Chemo Duck Program is pleased to announce a partnership with Tennessee Titans safety Cortland Finnegan. 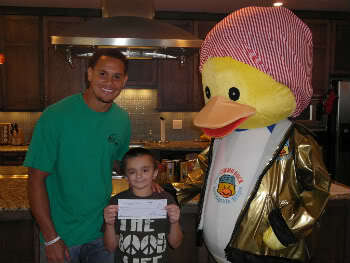 The NFL star has offered financial support to Gabe’s Chemo Duck Program through his own Cortland Finnegan ARK 31 Foundation, which is a non-profit organization committed to serving children with special needs and disabilities throughout the Middle Tennessee area. On Tuesday, July 26, Finnegan met with pediatric cancer patients at Gilda’s Club Nashville, a gathering place where people with cancer and their families and friends can join with others to actively involve themselves in building social and emotional support as a supplement to regular medical care. The Chemo Duck mascot and Gabe Sipos were also on hand to hand out goodie bags and hope to those in attendance. Gabe Sipos, a nine year-old cancer survivor and the inspiration behind Chemo Duck, is a rising young star with a breakout role opposite Gwyneth Paltrow in the recent film Country Strong. Gabe’s Chemo Duck Program is a program of the Nashville-based nonprofit organization, Gabe’s My Heart, which was established in 2004 to provide education and comfort to children living with cancer through medical play using therapeutic tools. The goal of the program is to enable hospital staff and parents to prepare children for chemotherapy treatment and eliminate the fear of the unknown. Chemo Duck is a stuffed yellow duck dressed in blue hospital scrubs with a bandana around its head, a chemotherapy port on its chest and an immobilizer on his arm. In a gentle, age-appropriate manner, children learn what to expect during cancer treatment and have a friend to share the experience. In turn, children can use Chemo Duck to help friends, siblings and classmates to understand and empathize with their experience.